How can I reuse or recycle leftover vegetables AFTER making stock? | How can I recycle this? How can I reuse or recycle leftover vegetables AFTER making stock? Can I compost the mushy leftover veg after I’ve made stock? Like I said regarding Weetabix, one of the general rules for a basic compost heap is to avoid putting things in there which will attract vermin. Just about all food stuff will rot down to compost, the key is to avoid the heap or non-sealed bin becoming a nuisance in the meantime. 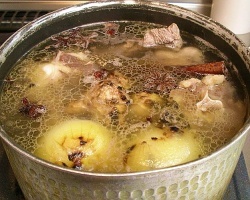 In terms of those stock veggies, I would say a big giant no if they’ve been cooked with any meat, fish, bones or animal fat: the scent will probably cling to them and might cause a problem. If it’s just a veg stock though, it’ll be less of an issue so I’d probably compost them. Before flinging them though, can they be put to any other ultra-thrifty/non-wasteful culinary uses? I’ve heard some people keeping back starchy things to use as a thickener for soups or stews. I’ve also heard about people using them as a bulking agent – alongside plenty of meat/fish and grains – when making homemade pet food. Mash it, add a whisked egg, some flour, breadcrumbs, salt and a pinch of baking powder. Make burgers and fry them. I just tried this with spent chicken stock materials… not too bad. It’s more like a crab cake consistency, but it works. Thanks for the idea! I have actually never had a problem when I have put cooked vegetables that have been in meat stock or even scraps of meat that go into my compost. The worms have a go at it all and we have never had vermin, or cats or dogs attracted to it. To make something from it to eat efter words would be not be very nutritional I would think as all the “goodness” should have gone into the water otherwise you’re not doing it properly. I usually do my stock several times, so get an intense yield intially then a weaker one which I use straight away for cooking rice, saves on putting into another conatainer and doing the washing up, can even re-use the pan. AAArgh I am turning into my mother…..
Usually if I’m using chicken, turkey, or ham then once I’ve made the stock then I’ll give the meat to my cat. She loves it and will even eat the tough gelatin pieces once they are softer. Remember if making dog food, do not use onions. They will cause a dog to be anemic and should never be fed to them in any form. We cube the boiled beef, potatoes and carrots and make russian salad (add mayonnaise, peas, cubed pickles). This is assuming the vegetables are not complete mush. I don’t really think it would be very healthy to use it in homemade dog food, there wouldnt be much nutrients left. A drop of honey, probably about 1/8 tsp. Blend all in a food processor until very smooth. Transfer to a larger bowl or saucepan, and whisk in enough water to reach your preferred consistency. I tend to like it thicker. To be a bit closer to traditional gazpacho, don’t forget to add a little bit of vinegar. Naturally, the more water you add, the more additional seasoning you may prefer to add. Chill and serve with a squeeze of lime, freshly chopped cilantro, and croutons (made from that crusty dry bread you don’t know what to do with!). I find this is a nice multi-purpose base in itself, for all different kinds of soup. I’ve even made dip out of it! It’s easy to freeze one cup portions for later use. I’d say use it as a filler for pet food if there’s no onions. But if you let it dry a bit and take out as much of the meat and fat as possible, the worms won’t mind. Blend it smooth and add speices. Spread it onto a cookie sheet and bake on low intil crisp. Makes great crackers. What spices do you add? what thickness and what tempature and how long? Once I poured off my vegetable stock, I blended the remaining veggies with a hand blender, added a little stock, salt and pepper, and made a yummy vegetable soup. I don’t really think you can go wrong so long as you add enough flour/ nutritional yeast for thickness. I also added walnuts. YAY! I’ve just made a veg stock and used a lot of veg to make it tasty such as a carrot, leek, celery, turnip, onion, parsnip and a garlic clove. The garlic I used at the end of cooking. I found this site because I was looking for useful ways to use the left-over veg – such a shame to waste it, because it’s quite tasty. I, too, was thinking about the nutritional value as there probably isn’t any, since I let it boil for an hour and used 2 1/2 pints of water and then pureed it down. But reading this site has given me ideas. Could easily add nutritional food to it and turn them into like burgers or use them to make potato cakes etc. there are a lot of possibilities. What I would like to know is how long could I keep it frozen in the freezer. Extremely irresponsible to suggest pet food as most stocks contain onion and/or garlic, which can slowly kill cats and dogs over time. Shame.